Visit Baton Rouge&apos;s Welcome Centers are located throughout the city and serve as information hubs for all things to do and see in Baton Rouge. Staffed with educated and passionate travel counselors, these welcome centers are ready with resources to help you plan your trip! Call or come by to browse brochures and other promotional materials for area attractions, restaurants, hotels and more. Hours: Sunday – Saturday, 8 a.m. – 4:30 p.m. 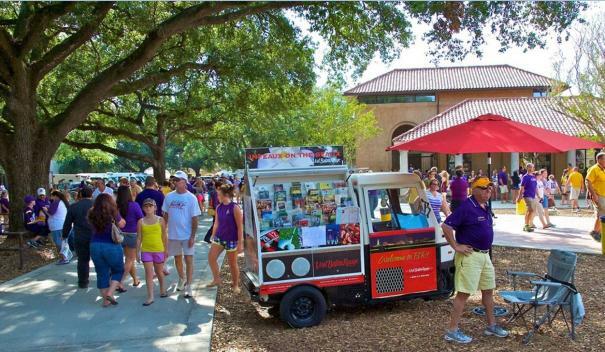 Hours: Sunday – Friday, 9 a.m. – 4:30 p.m.
Infeaux on the Geaux is our mobile information cart. Look for it at local festivals and events to find helpful resources on what to do in and around Baton Rouge.